ALS Research Forum | Can Immune Gene Expression Predict Pace of Motor Neuron Destruction? Can Immune Gene Expression Predict Pace of Motor Neuron Destruction? How quickly amyotrophic lateral sclerosis progresses may depend on the immune system, according to a study published March 16 in Acta Neuropathologica Communications. Taking an unbiased look at data garnered from the circulating immune cells of ALS patients, researchers led by Pamela Shaw and Winston Hide at the University of Sheffield in England found that the expression of three immune genes in the blood predicted the pace of deterioration. They claim this troika could serve as a useful prognostic biomarker. The researchers also reported that cerebrospinal fluid (CSF) levels of soluble TREM2—an indicator of immune cell activity in the brain—shot up early in disease, and declined later on, much as it does in people with Alzheimer’s. Together, the findings implicate the immune response to diseased motor neurons in the rate of the neurons’ demise, commented Stanley Appel of Houston Methodist Neurological Institute. What’s more, the authors provide support for a disease-specific inflammatory response outside of the central nervous system, he added. ALS progression varies widely, even among patients who harbor the same genetic mutations. While some imaging, electrophysiological, and even fluid biomarkers track or predict progression, it is unclear if they are specific to ALS (see Dec 2013 news; Jun 2015 news; Mar 2017 news). This dearth of specific, predictive markers makes accurate prognosis difficult, and also complicates patient selection for, and analysis of, clinical trials. To find better prognostic markers, first author Johnathan Cooper-Knock and colleagues took an unbiased, data-driven approach. 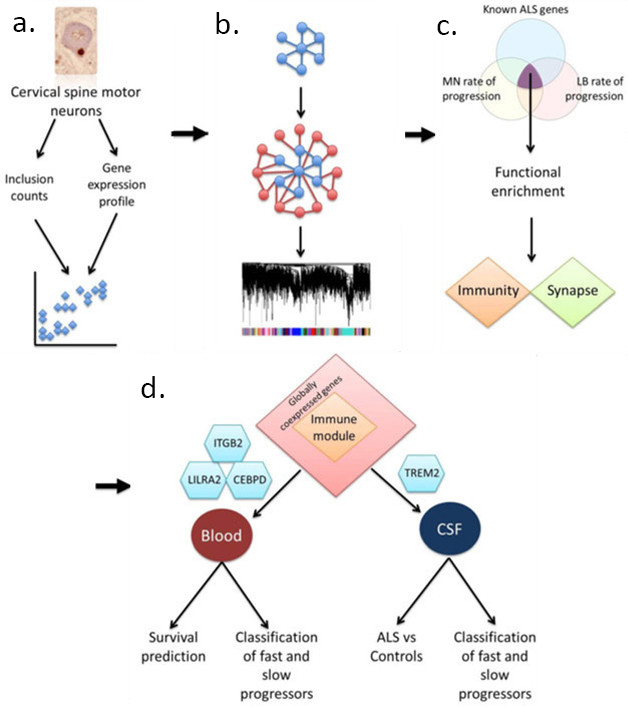 In a nutshell, the researchers first looked for motor neuron gene expression patterns that correlated with ALS pathology in a small number of patients. Then, they used those genes to identify wider gene networks, or modules, whose activities correlated with disease progression in a larger patient sample set. Finally, they tested the most promising genes for biomarker potential, by measuring their expression in the blood lymphocytes of ALS patients and controls and in CSF (see image above). To generate their initial list of genes, the researchers used laser capture microscopy to pluck at least 800 individual motor neurons from each of 11 postmortem spinal tissue samples, and then quantified their entire transcriptomes. Four patients had sporadic ALS, and seven were C9ORF72 hexanucleotide expansion carriers. In parallel, the researchers counted the number of p62 inclusions in nearby neurons from each sample. Correlating the transcriptomes with the protein pathology, they identified 83 transcripts that seemed specifically up- or down-regulated in ALS. Casting a wider net, Cooper-Knock used these 83 transcripts to create a larger network of genes known to be co-expressed. The researchers then subdivided that network into 82 modules of tightly co-expressed genes. Each module—essentially a clique of transcripts that share the same expression pattern—contained anywhere from 35 to 515 transcripts, and 45 modules contained at least one of the original 83 pathology-related transcripts. To find the genes most tightly associated with the rate of ALS decline, the researchers next cross-referenced these 45 modules to three independent data sets. The first included 1,705 transcripts, from laser-captured motor neurons, which correlated with disease duration in 14 ALS patients, including the 11 patients used in the original p62 correlation study. The second comprised 4,070 transcripts, from blood-derived lymphoblastoid cell lines, that were differentially expressed between eight C9ORF72 carriers with slowly progressing disease and 18 carriers who deteriorated rapidly. Rapid progressors had a disease duration of less than two years, while slow progressors survived longer than four years following diagnosis. Finally, the researchers checked if any of the modules contained any of the 62 hits from prior ALS genome-wide association studies. They then ranked the 45 modules in order of how enriched they were with genes from the three data sets. The two most enriched modules contained genes from all three. The top one was chock-full of immune genes, while the runner-up contained genes related to synaptic transmission. The researchers focused on the immune module, reasoning that it had the best chance of containing genes that could serve as biomarkers in accessible tissues, including blood. Oddly enough for a module generated from laser capture microdissection of motor neurons, more than half of its 65 members, including TREM2, are known macrophage and microglial genes. The authors think that by comingling with damaged motor neurons, microglia may have hitched a ride during the laser capture. Despite this accidental windfall, Cooper-Knock still views the results as valid. He added that these hitchhikers are likely to be the microglia most intimately responding to diseased neurons. To test for potential biomarkers, the researchers correlated expression of the module genes in patient lymphoblastoid cell lines with disease duration. Sure enough, expression levels of 15 of the genes distinguished 18 C9ORF72 carriers with rapidly progressing ALS from eight with a more slowly developing disease. Expression of 20 genes distinguished 10 rapidly progressing sporadic ALS patients from 10 people with slowly progressing disease. There were three genes in common—LILRA2, ITGB2, and CEBPD. All are expressed in macrophage/microglial cells, and involved in stimulating inflammatory immune responses. LILRA2 is a cell surface receptor; ITGB2 an integrin involved in leukocyte adhesion and activation; and CEBPD is a transcription factor. Considering expression levels of all three at once correctly classified the speed of decline of 85 percent of C9ORF72 carriers, and 60 percent of people with sporadic disease. Cooper-Knock speculated that the lower predictive power of the biomarkers for sporadic disease likely stems from the greater heterogeneity in those cases, and that better specificity and sensitivity would be needed in the clinic. However, he added that because of the small sample size, the numbers are not conclusive and that he plans to test the blood biomarkers in larger numbers of ALS patients. He added that studying the function of these genes, and determining how they are involved in pathology, could help the field better understand ALS as well. Researchers agreed that if these results hold up in further testing, the markers could prove useful in disease prognosis, clinical trial selection, and tracking of response to treatments. “Overall, this study represents a first and important non-biased step in searching for disease markers in ALS that can be measured in accessible tissues, and thus can be used to predict disease progression, and eventually enable personalized medicine,” commented Michal Schwartz of the Weizmann Institute of Science in Rehovot, Israel. The findings dovetail with a recent report from Appel’s lab that dysfunction of regulatory T cells correlated with more rapid disease progression (see Beers et al., 2017). Appel said activation of circulating monocytes does as well. One possible explanation for peripheral immune cell involvement in ALS is that motor neurons are not completely walled off behind the blood-brain barrier, Appel said. Rather, at neuromuscular junctions, their axons come into direct contact with the systemic immune system. TREM2 popped up in a screen for proteins known to interact with those translated from genes in the immune module. Given that genetic variants in TREM2 have been linked to ALS (see February 2014 news; Cady et al., 2014), and the soluble extracellular domain of the protein to neurodegeneration, the researchers tested if CSF sTREM2 correlated with ALS progression. The protein ticked higher in CSF samples from 46 sporadic ALS patients, compared to 20 controls. Furthermore, sTREM2 appeared to rise early in disease, and fall in the late stages, similar to what has been reported for AD (see Suárez-Calvet et al, 2016a; Suárez-Calvet et al, 2016b). Interestingly, superimposed on this inverted U pattern, higher sTREM2 levels correlated with slower deterioration in later disease, hinting at a potential protective effect of the protein. “This interesting study highlights the importance of a TREM2-dependent, potentially protective, microglia function in the pathogenesis of ALS,” wrote Christian Haass and Marc Súarez-Calvet of the German Center for Neurodegenerative Diseases in Munich in a joint comment to Alzforum. 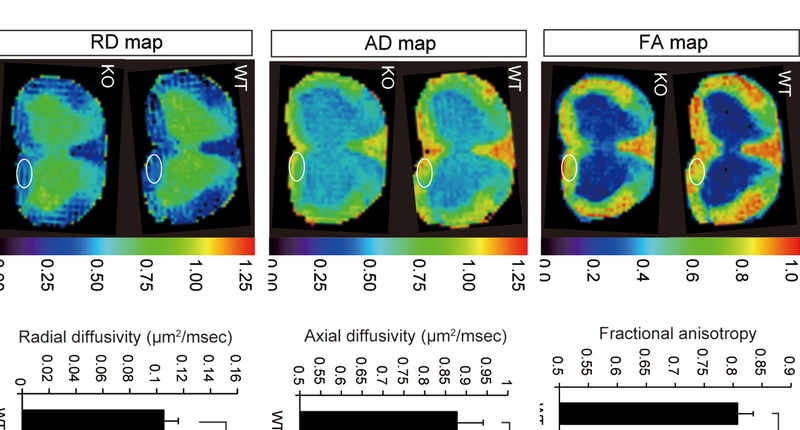 “This also supports a general function of TREM2 and microglia as modifiers for several distinct neurodegenerative diseases.” They added that longitudinal studies in larger cohorts will be needed to confirm these effects. Laura Piccio of Washington University in St. Louis, who has studied CSF sTREM2 in AD and multiple sclerosis, thought the parallels between sTREM2 expression in different neurodegenerative diseases was intriguing (see Heslegrave et al., 2016; Piccio et al., 2016; Piccio et al., 2008). However, she urged caution in interpreting the results, pointing out that the difference between sTREM2 levels in early and late ALS disease appears to be driven by a single outlier. Cooper-Knock acknowledged the need to confirm results in larger numbers of patients. He proposed that high levels of sTREM2 early in disease could reflect a neuroprotective, phagocytic microglial response. Differing genetics could then dictate how rapidly that beneficial response sours, transforming into a damaging, pro-inflammatory response as sTREM2 drops. However, he and other commentators added that the function of sTREM2 is far from clear. For example, a recent study found that soluble TREM2 triggers pro-inflammatory responses in microglia (see Feb 2017 news). Cooper-Knock J, Green C, Altschuler G, Wei W, Bury JJ, Heath PR, Wyles M, Gelsthorpe C, Highley JR, Lorente-Pons A, Beck T, Doyle K, Otero K, Traynor B, Kirby J, Shaw PJ, Hide W. A data-driven approach links microglia to pathology and prognosis in amyotrophic lateral sclerosis. Acta Neuropathol Commun. 2017 Mar 16;5(1):23. PubMed. Beers DR, Zhao W, Wang J, Zhang X, Wen S, Neal D, Thonhoff JR, Alsuliman AS, Shpall EJ, Rezvani K, Appel SH. ALS patients’ regulatory T lymphocytes are dysfunctional, and correlate with disease progression rate and severity. JCI Insight. 2017 Mar 9;2(5):e89530. PubMed. Piccio L, Buonsanti C, Cella M, Tassi I, Schmidt RE, Fenoglio C, Rinker J 2nd, Naismith RT, Panina-Bordignon P, Passini N, Galimberti D, Scarpini E, Colonna M, Cross AH.Identification of soluble TREM-2 in the cerebrospinal fluid and its association with multiple sclerosis and CNS inflammation. Brain. 2008 Nov;131(Pt 11):3081-91. Epub 2008 Sep 12 PubMed. Guo J, Yang X, Gao L, Zang D. Evaluating the levels of CSF and serum factors in ALS. Brain Behav. 2017 Mar;7(3):e00637. Epub 2017 Feb 19 PubMed.